Providing children with a plant-growing primer doesn't necessarily require an outdoor garden and weeks of waiting. Pennsylvania's Buzzy, Inc., sells several lines of indoor seed-starting kits with kid-appeal themes. These include three whimsical collections of 2- to 5-inch-deep ceramic or clay animal-head pots, in forms from amphibians to zebras. Each kit also contains a dehydrated growing-medium pellet and annual ryegrass (Lolium multiflorum) seeds. Properly planted and watered, the seeds should begin adorning their host animal's head with a lush grass topknot in about one week. Hydrating the flat pellet included in your grass-growing kit transforms it into enough nutrient-rich medium to support the seeds' germination and growth. Place the pellet in a cup or small bowl, and add 1 tablespoon of water just warm to the touch. Watch as the absorbed water expands the pellet. When it stops growing, let your child crumble it apart into loose growing medium with a fork. If necessary, gradually add more water until the medium is evenly moist, but not wet. As the grass seeds germinate, they send roots down into the growing medium to take up nutrients and water. To ensure they absorb all they need, add three-quarters of your prepared medium to the pot before planting the seeds. This ensures the roots plenty of space for expansion. Then count out 10 seeds; scatter them evenly on the surface, and cover them with the remaining moist medium. To water your germinating seeds, lightly mist them with a spray bottle enough to moisten the medium each day. Once they've sprouted and begun to fill in, consider placing the pot in a shallow tray and watering it from the bottom. Doing so encourages deep roots for the healthiest growth. Pouring water directly on the grass may saturate the medium and deprive the roots of the oxygen they need. Germinating seeds like nothing better than light from above and warmth from beneath. To accommodate yours, place the pot in a sunny, south- or west-facing window where the temperature hovers between 70 and 75 degrees Fahrenheit. If that's not possible, set it on a heating mat, and suspend a fluorescent grow light 2 to 3 inches above the surface of the medium. Keep the light on between 12 and 16 hours each day, advises the KidsGardening section of the National Gardening Association. When the germinated grass reaches 1 1/2 inches tall, remove the heating mat but keep the pot in the sunny window or beneath the grow lights. When the grass reaches the desired height, use sharp, clean scissors to trim and style the animal's "hair" to your child's liking. 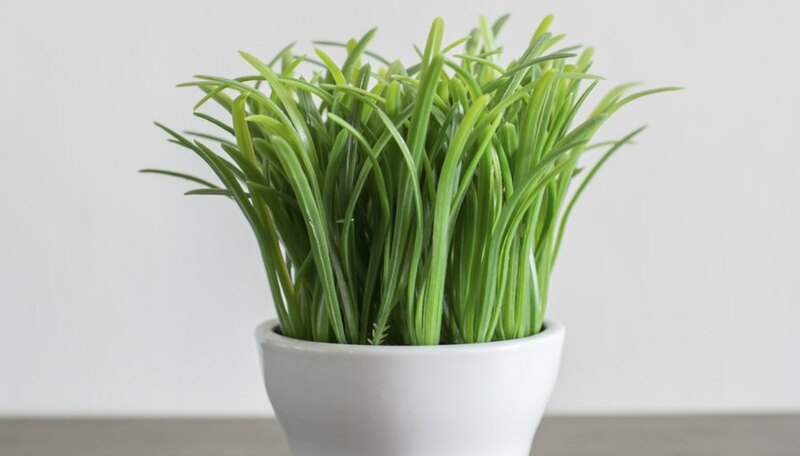 With regular watering, the grass continues to grow until its root system begins escaping the pot. It won't need fertilizing.